We’ve been looking forward to the launch of The Peninsula Paris ever since the hotel group announced, six years ago, that it was going to make its European debut. Located a short walk away from the Arc de Triomphe, the 200-room property occupies a century-old building, which was previously the Hotel Majestic – one of the city’s grande dames. 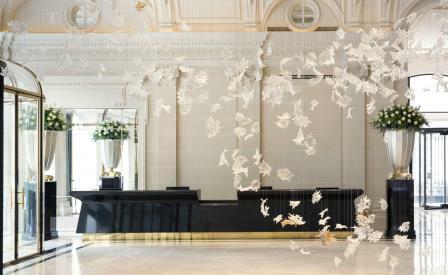 Both the façade and the interior has been meticulously restored by local craftsmen, and the hotel now comprises six dining areas, including a rooftop restaurant with views of the Eiffel Tower, a 22m indoor swimming pool and a lobby featuring a bespoke Lasvit chandelier made up of 800 individual hand-blown crystal leaves. With its own dedicated in-house technology team, The Peninsula Paris can safely say it has the world’s most technologically customised rooms, where everything – from laundry collection to bathroom ambience – can be controlled at the touch of a button.